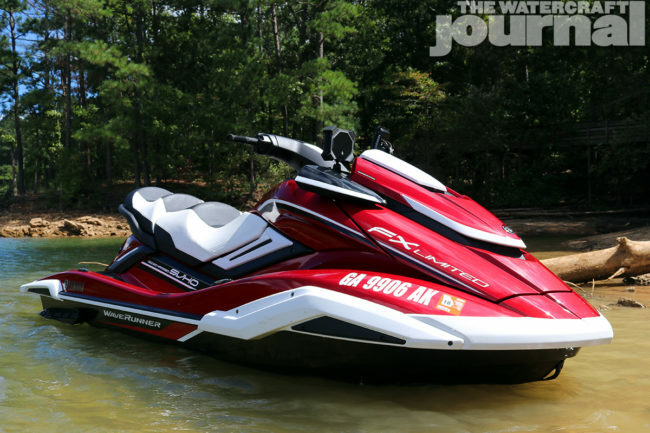 A Worthy Successor: 2019 Yamaha FX Limited SVHO (Video) | The Watercraft Journal | the best resource for JetSki, WaveRunner, and SeaDoo enthusiasts and most popular Personal WaterCraft site in the world! 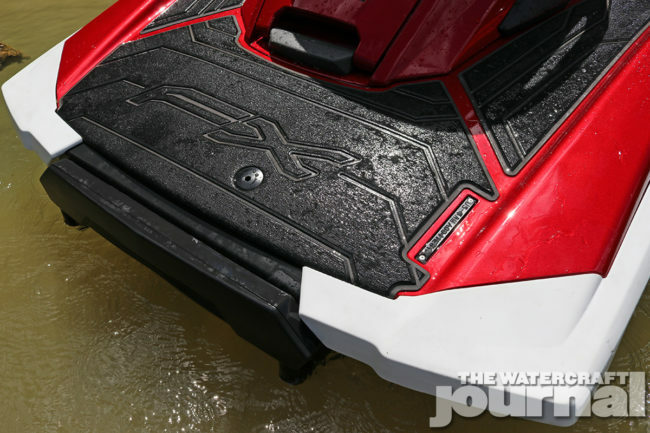 Yamaha’s GP1800 (and now GP1800R) is a masterclass in universal hull design. 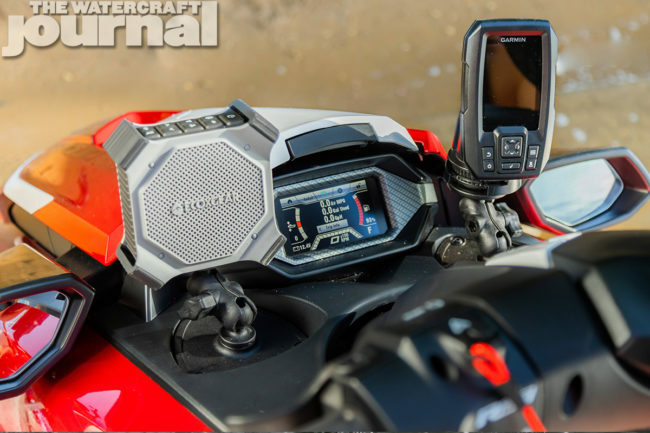 Impressively, the shape of the business end of the GP is identical as the lowly VX (molded in traditional FMC), to the lightweight NanoXcel-hewn VX Deluxe, to the ultra-featherweight GP1800R made from NanoXcel2. 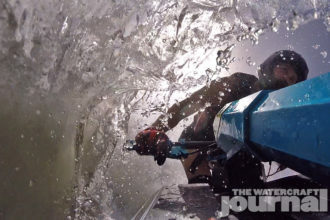 It is in this ultimate form, that the GP1800 demonstrates its talent at maintaining a through-line in crosshatching waves, maintaining a level attitude in rough seas, and capacity of executing either a hairpin or wide swoop without its bow hunting or darting left to right over an ever-undulating water’s surface. 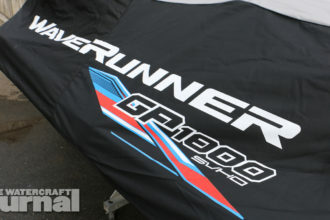 If it didn’t do so, the GP1800 wouldn’t be winning so many races. It’s from this design that Yamaha’s hull shapers first began. No, it’s not merely an enlarged version of the GP but benefits from lessons learned there. 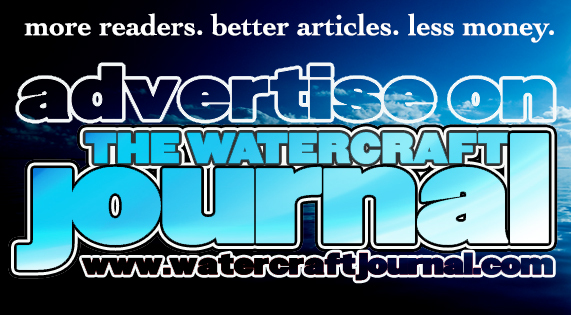 Both craft benefit from a shallower deadrise and less pronounced keel, relying more on full-length lifting strakes running along the wetted surface to elevate the craft up and onto the surface. Semicircular, rounded chines also give both the GP and FX hull lift, attributing to either craft’s predictable tracking over erratic sea states. 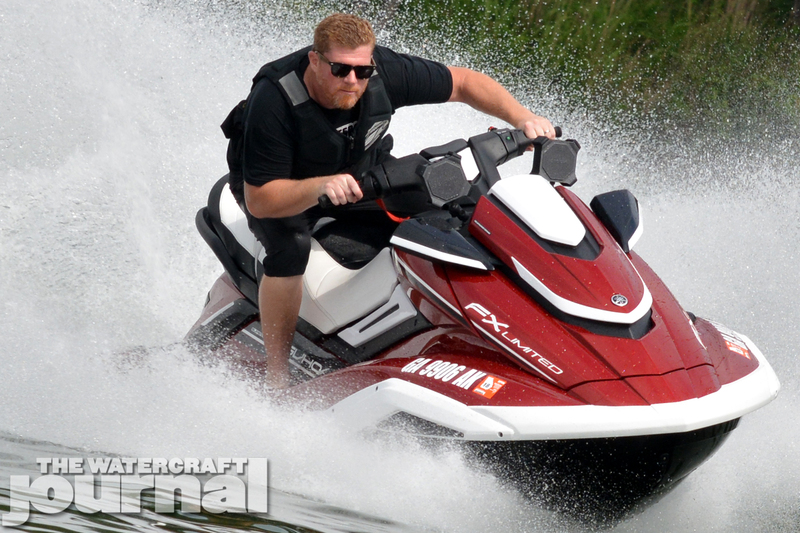 Departing from the VX/GP design, the new FX features a sharp spray-deflecting ridge splitting the bow that sweeps into an angled outside chine, permitting the full-sized 3-seater a very natural and intuitive inside-lean that rolls gently and naturally like a motorcycle as you angle into a corner. The obvious dimensional differences between the VX/GP and FX platforms are overt as well; at 140.9-inches, it is a true 9-inches longer than the aforementioned, and 2-inches wider at 50-inches. 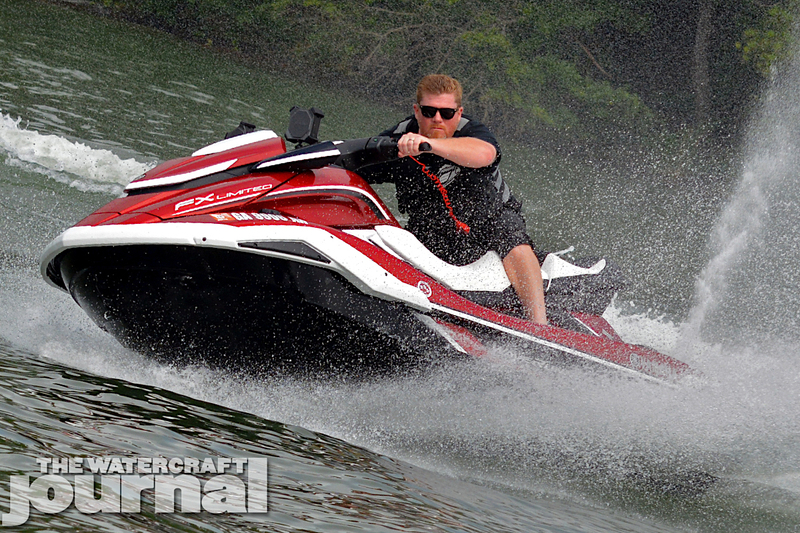 Compared to the previous year’s FX Limited SVHO, the current model is one inch longer and 2-inches wider, and impressively, 14-pounds lighter than the ’18, coming in at a relatively svelte 822-pounds. 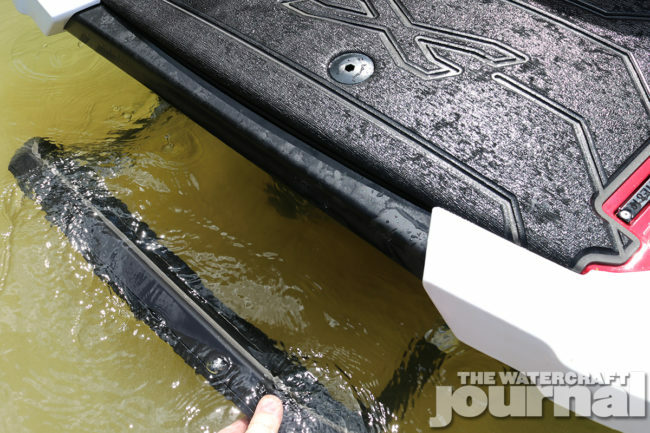 Moreover, the larger and more accommodating 2019 FX platform is better equipped to soak up the harmonics and vibrations from skirting over the water, even when hewn from Yamaha’s NanoXcel2 hull and deck material. 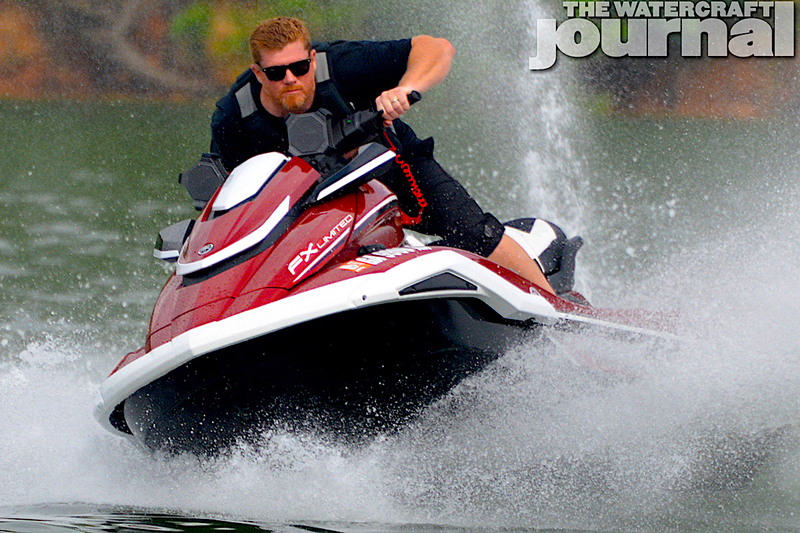 This means that the FX is not only impressively predictable in rough water, but far better insulated to give the pilot a smooth, enjoyable ride. Above the bond line, the new FX platform is equally impressive. Approaching from the rear, the transom is wide and flat, carpeted with two-toned, CNC-cut authentic Hydro-Turf matting. A thickly padded folding swim step is the largest and lowest-reaching in the industry. 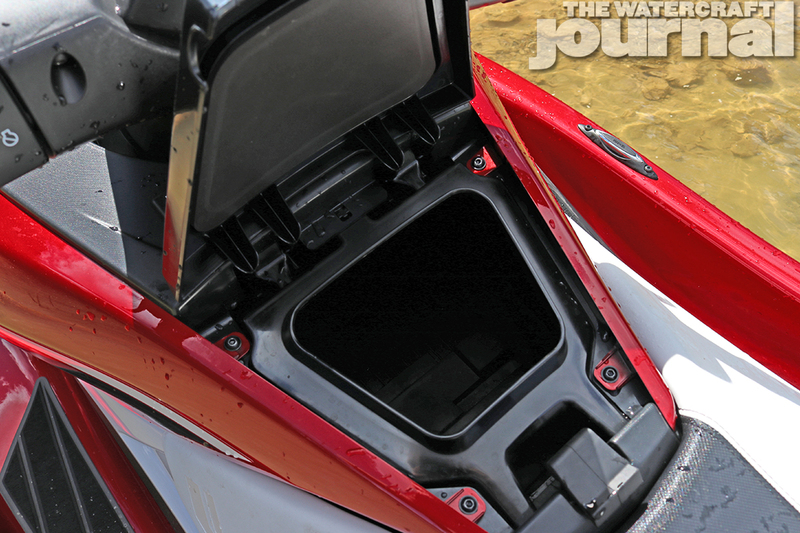 Reach up to find a wide grab handle below the integrated wet storage bin (below the tow eye and rearmost passenger seat). The reshaped footwells are wide, and scalloped with low gunwales. At their deepest point is a single gravity drain, funneling water down and out of the pump tunnel – a long overdue and warmly welcomed addition. The fairings arch high, giving the driver’s knees some space, before running down into the FX’s redesigned hood. The overall look is familiar to the previous FX, but subtly smoothed. Beneath the hood is a wholly revamped front storage locker accessed by a gaping rim permitting easier access from all angles. The inside of the bin is lined and insulated, and incorporates a large recess specifically measured to fit a soft-sided cooler that attaches to the bulkhead via a hook. 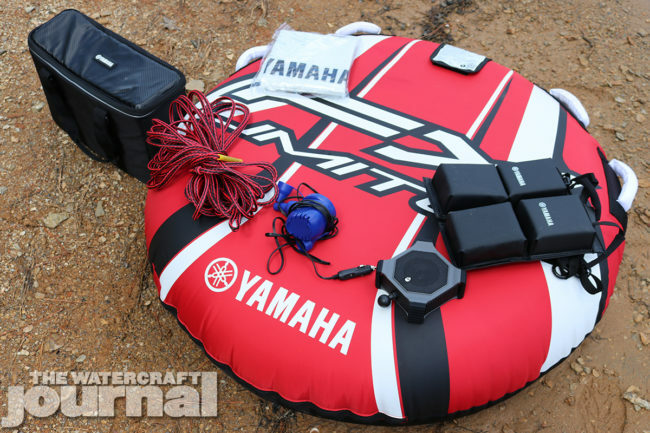 This cooler is only one of the many, many items included in the Yamaha’s Limited package, and is capable of carrying up to 24 8oz. cans. The hood is actuated by a gas shock that won’t put up a fight when closing the lid, either. For 2019, Yamaha relocated the filler cap from beneath the cowl to the outside fender, which admittedly breaks up the FX’s otherwise super-clean aesthetic. 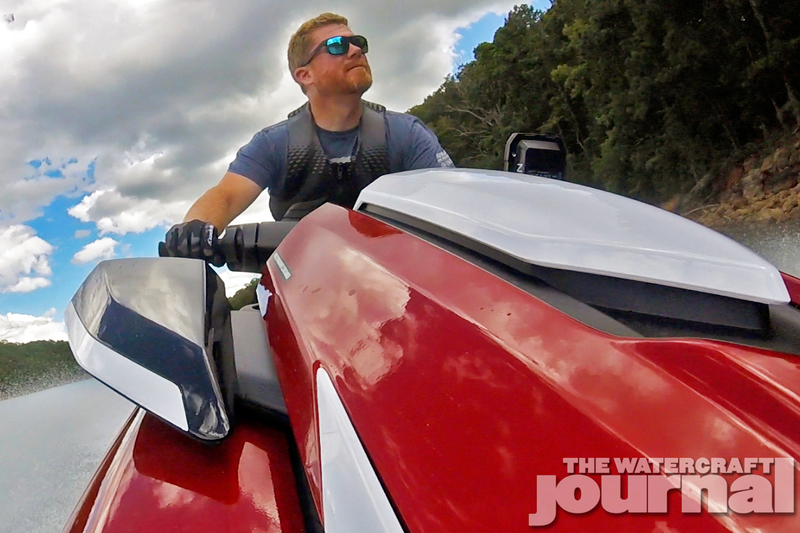 The neck feeds the WaveRunner’s 18.5-gallon fuel cell. Above, the cockpit is traditionally Yamaha: uncomplicated and utilitarian. 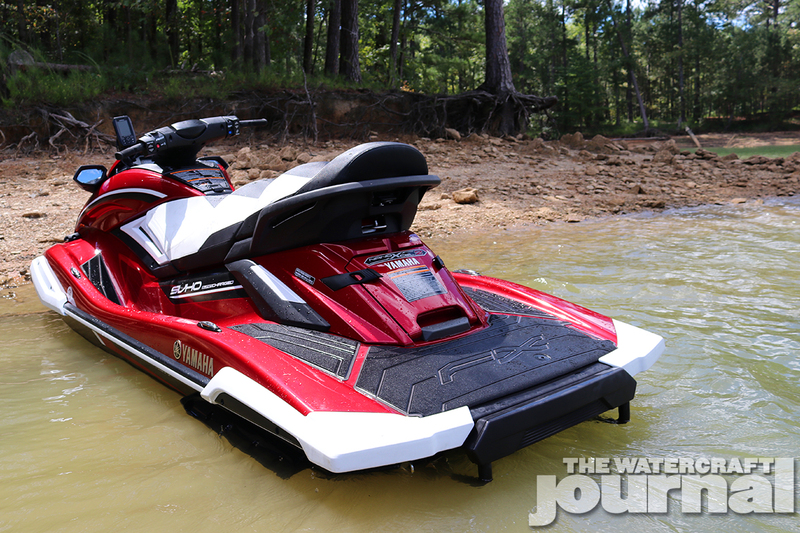 The FX Limited SVHO’s 5-point tilt steering system is uncluttered and features Yamaha’s dual-throttle RiDE breaking and reverse system, electronic trim control, No Wake mode and Cruise Assist controls, as well as the brand’s pistol grip handgrips. 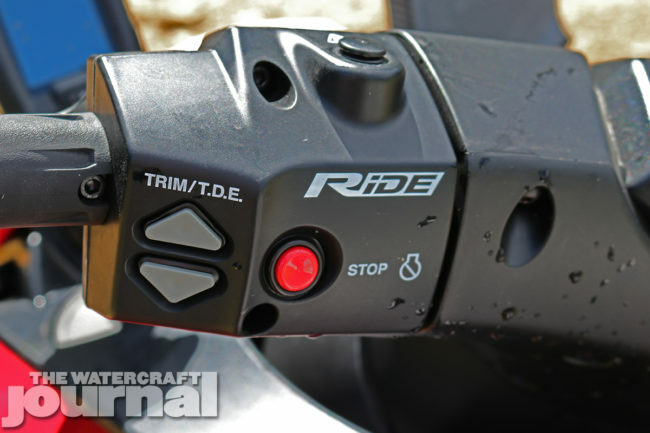 For 2019, Yamaha also “plussed” its trim control with TDE (Thrust Directional Enhancer). 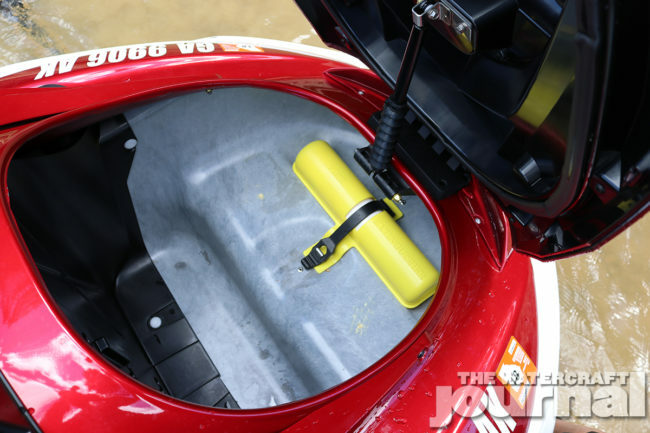 This allows the rider, while in neutral, to bump the left-hand toggles by one-mile-per-hour increments to pull alongside a dock or other tight space. 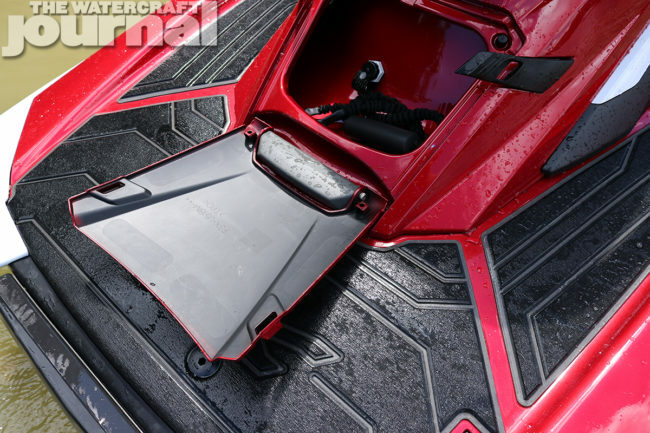 The feature can also be used to provide the watercraft a little extra oomph to back off of the trailer. 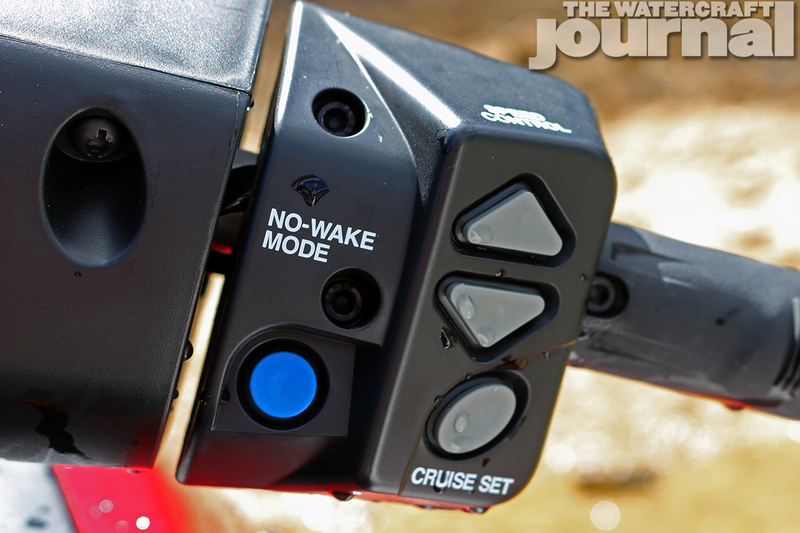 Equally, the rider can now “bump” or adjust the No Wake mode’s speed by toggling up or down using the Cruise Assist buttons. Fore of the steering system are two alcoves with hardened mounting plates. 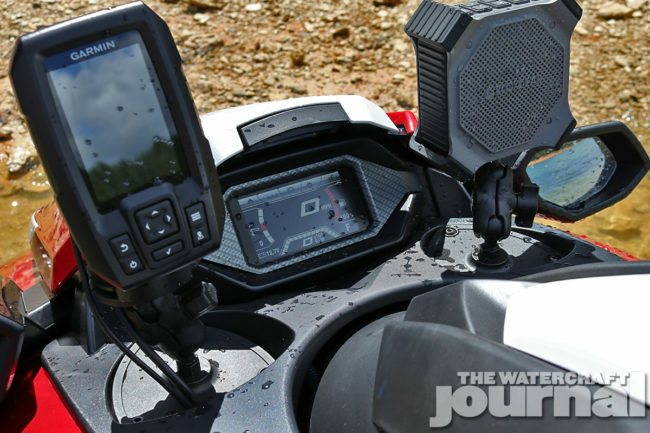 These are part of the extensive accessory partnership Yamaha made with RAM Mounts. 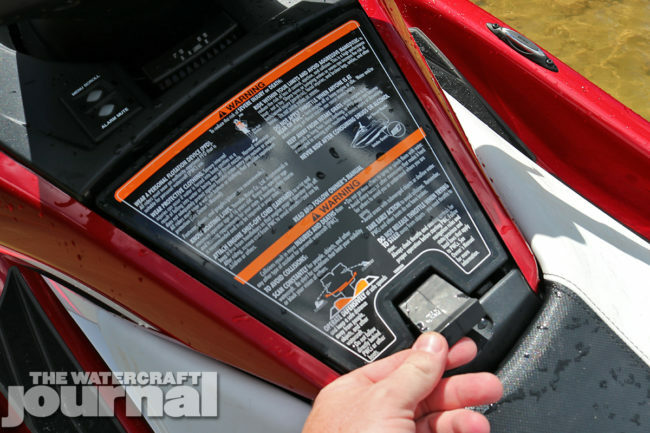 While most FX units will feature one mounting plate and a single cup holder, the Limited SVHO has two (the cup holder can be installed by backing out 3 Allen screws and replacing either of the plates), as well as a Garmin GPS Fish Finder with a transom-mounted transducer, and a pair of Bluetooth-controlled, waterproof speakers. 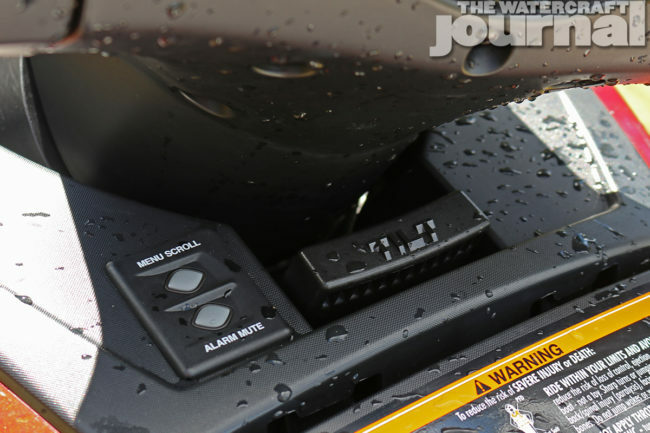 A variety of other accessories can be attached to the RAM mounts including fishing rod holders and more, which will be made available through Yamaha’s accessory catalog. Scott Watkins, Yamaha Watercraft’s WaveRunner Product Planner, explained, “The new touchscreen puts more control than ever in the fingertips of the rider, with more detailed information and customization than any other watercraft in history. In addition, we know that customers like to customize their ride, and the multi-mount system allows them to make their watercraft their own, for how they plan to use it, whether they’re cruising, making videos, beaching, touring, or fishing, the capability is all there.” You can even pick the color for the gauge needles and readouts. 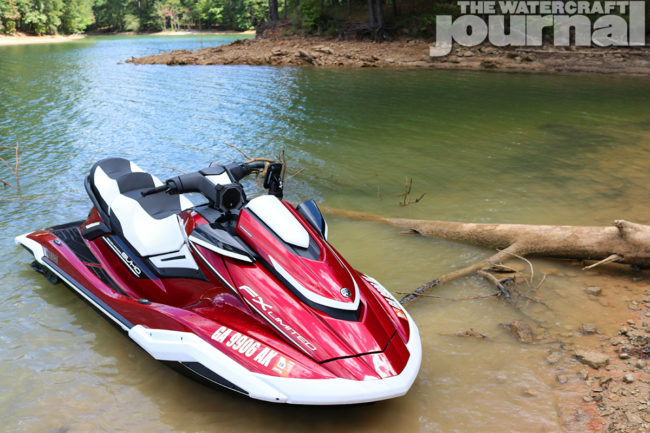 Because the touch screen function deactivates when the ski exceeds 20mph, Yamaha repurposed the buttons below the steering system to allow limited use of the multi-page functionality. Behind that is another bit of Yamaha innovation; a 100-percent waterproof glovebox. Both deep and padded with a soft corrugated liner, the glove box lid clicks open, and locks shut through the use of a rubberized latch. It’s a little awkward to operate at first, but once you get used to tugging up and moving it either back to open, or forward to seal closed, it’s easy to use. The spacious glove box also adds to the new FX’s whopping 44-gallons of total storage. Unique to the 2019 FX Limited SVHO, the three-tiered bench is arranged in a true stadium-style seating array, wrapped in premium cut-and-sew, stitched material that is both grippy and heat resistant. Gratefully, the rear plastic cladding and third passenger handrail are smartly shaped as not to rub or interfere while solo riders do so standing up. Otherwise, the contoured front seat narrows at the knees and tapers inboard, permitting for comfortable riding, either feet forward, or tucked beneath. And for the aggressive riders, dropping a knee into the tray for a breakneck hairpin is even easier thanks to the added room and angled footwells. We’d certainly be remiss to go on without properly listing the other accessories that come with the Limited package (in addition to the Garmin GPS, fish finder transducer and dual speakers); a single-place tube specifically color matched to the ’19 FX Limited SVHO’s Deep Red Metallic hue, an electric tube inflator and 12V outlet, a tow rope, a matching PWC cover with glove box access panel, a tube holder, a tow rope bag, fenders and the aforementioned soft-sided cooler. 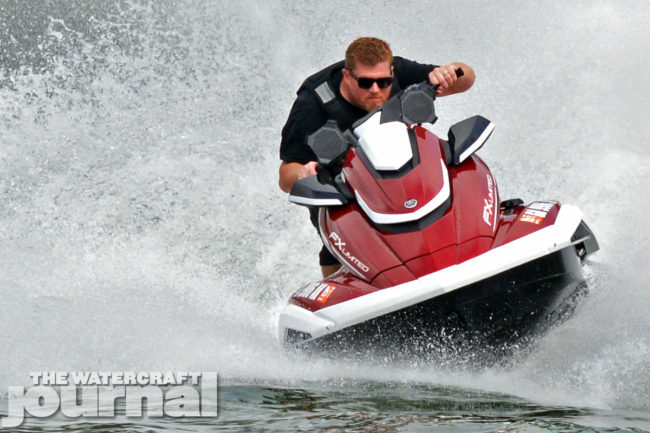 All of this adds up to a PWC priced at a hefty $17,399 MSRP, yet, considering the $1,200 price difference between it and the next-most-equipped FX – the SVHO Cruiser – and the near-$3,000 worth of accessories, and the Limited suddenly becomes a surprising bargain. 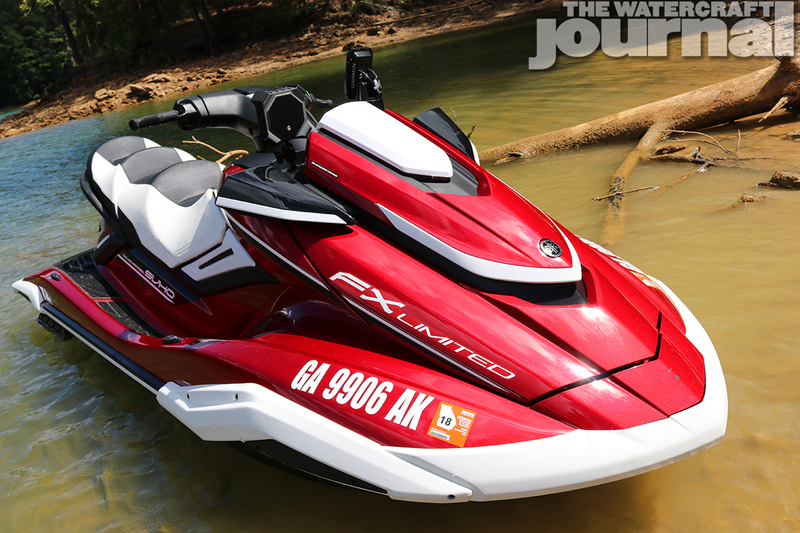 At wide-open-throttle, the centrifugally-supercharged Super Vortex High Output engine propels the FX Limited SVHO to a GPS-confirmed and sustained top speed of 69.3mph with half a tank of fuel over the glassy surface of Lake Allatoona, GA., it’s top loader intake grade feeding the FX’s 160mm axial-flow pump. With a slight loss of weight, the maxim of “there’s no replacement for displacement” once ballyhooed for the 1,812cc 4-cylinder – the largest in the PWC industry – bows to the might of a superior power-to-weight ratio. At neutral trim, the SVHO-powered FX whistles across the water, kicking up a fantail twice as wide as it is high. Rider input is slop-free and precise. While piloting through windblown chop, the FX’s hull rises taller and tracks straight. 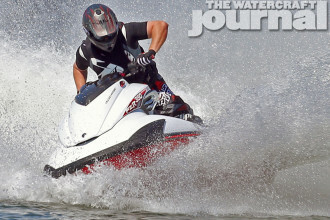 This means that in open ocean or in truly grueling lake conditions, the supercharged Yamaha will skim the crisscrossing waves rather than plow through them, all the while failing to erratically search or hunt. In our testing, we had the pleasure of pushing the FX Limited SVHO in both ideal and less than ideal conditions, and the craft is both equal parts predictable and silent. The entirety of the new FX is surprisingly muted; gone are any indecipherable squeaks, chatter or pops that lightweight materials and plastic fairings can often emit. All you get is the howling of wind whipping past your ears and the mechanical staccato of the thrumming engine spinning at just under 8,000rpm beneath your feet. 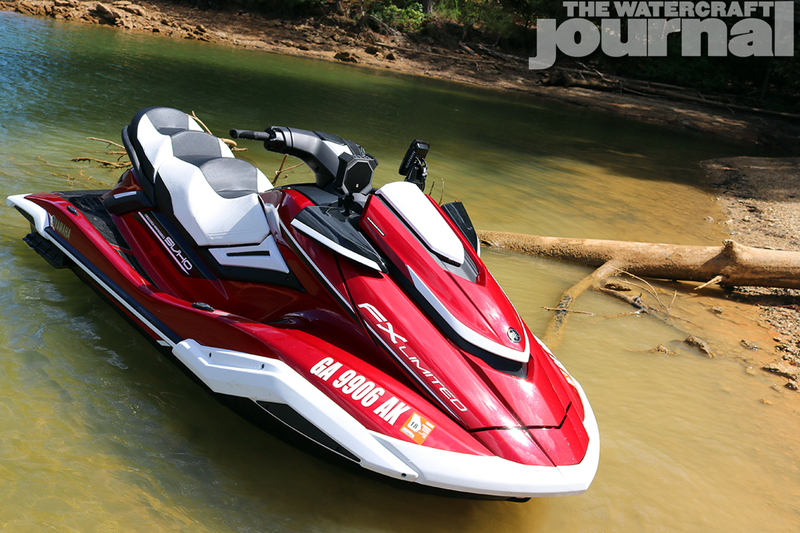 Yes, the new 2019 FX Limited SVHO WaveRunner is a worthy successor to the previous model. Heck, make that an emphatic yes! We struggled to find any glaring flaws in the machine, apart from the clunky aesthetic of the exposed gas cap. We’d also would rather see any at-speed gauge controls moved from the dashboard to the handlebars to keep rider’s hands on the grips at all times. 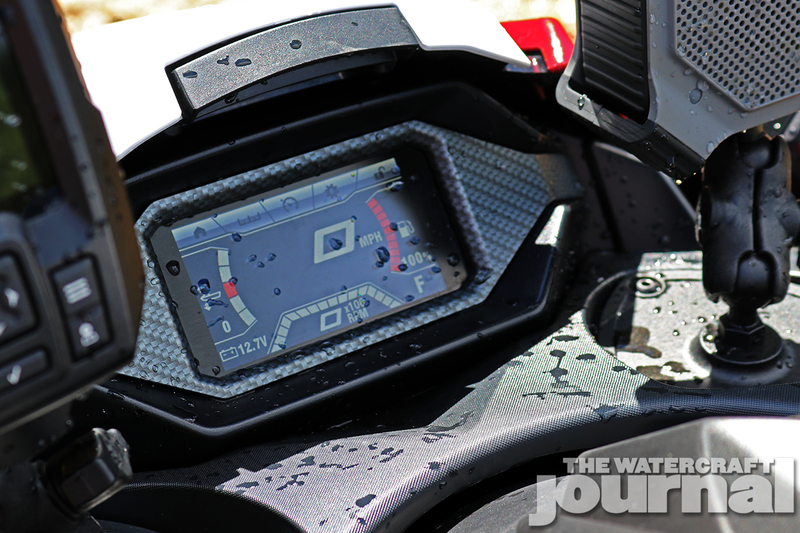 Other than those two quibbles, we were hard-pressed not to gush effusively over Yamaha’s newest flagship. 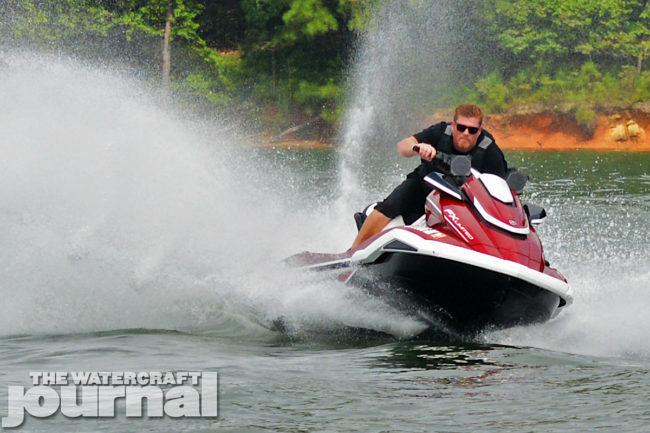 From its sleek and powerful new shape, to its confidence-inspiring ride and all-water surface handling, to the virtual accessory-catalog’s worth of add-ons, this machine, above all others, is the benchmark for luxury performance.